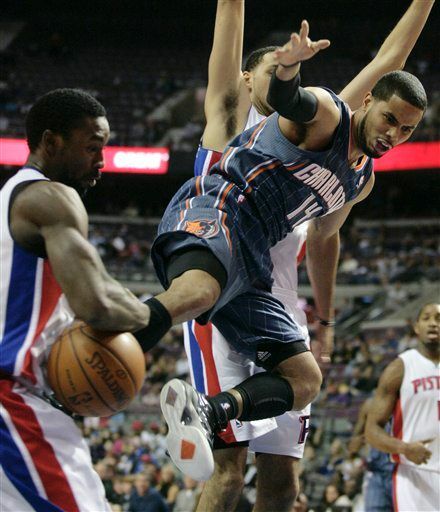 The Charlotte Bobcats fell on the road to the Pistons, 97-90, on Friday night to drop to 1-4. Only a few games into the season and it seems like we’re already beating a dead horse: turnovers. The Bobcats had 22 of them (compared to the Pistons 12) which completely negated their 55% to 43% shooting advantage. The Cats got off to another slow start in this one, playing soft D and allowing the Pistons to build a 41-19 lead just a few minutes into the second quarter. Nazr Mohammed continues to underwhelm, and was benched for the second half in favor of a small lineup. Another concerning stat: the usually aggressive Bobcats only got to the line 11 times; while the Pistons earned 27 free throws (and made all but one). The Cats comeback in the second half was OK. Derrick Brown and DJ Augustin both played pretty well; each hit a couple of big threes to keep the Cats hanging around. And Stephen Jackson had his best game of the season, pouring in 28 points on 12-19 FG/4-8 3PT. But he also had a team-high 6 turnovers. To hammer home the turnover issue a little further, the league average looks to be around 15 per game. At the beginning of the night, the Kings lead the league in fewest turnovers per game at 11.8 per; the Timberwolves give up the most at 20 per. The Bobcats are the second worst at 18.3 per game; obviously that number will creep a bit higher after tonite’s 22. Bobcats Weekend Preview and… James Johnson? Disappointing start so far, folks. Prepare for the year of the Warrior. Jason – you might be spot on with that prediction. What a let down from the momentum that the Cats had closing the season last year. I know Stephen Jackson had a pretty good game, but something just doesn’t look right with him. He seems a lot slower and frustrated in these first five games. How about those Warriors? Is Steph back, yet? Yeah, dude. He’s back. 20 points (11 in the fourth) and 6 assists last night. Jax has lost a 1/4 step from last year whether due to injury or age. I think it’s time to look at trading our only asset that anybody desires… Crash. He and Tyrus are the same type of player and should never be in the same starting lineup. We trade him for a C (not sure who). Moving Jax to the SF wouldn’t require him to play as quick would bring the opposing SF away from the paint. We start Hendo or look for a trade for a veteran SG for perhaps Nazr. UPS backs up the SF and when Jax is on his way out we have our future SF ready in the wings. The season isn’t a loss yet and I’m not trying to be negative but this team is not built to win a playoff series should they even make the playoffs. Jeremy, your suggestion seems pretty extreme. Though, I can’t say that the same kind of thought hadn’t popped in my mind during that horrible first half against the Pistons. The Cats will likely work to make a “panic trade” in the next month or so… Larry Brown won’t waste his time on a losing season, but I’m not so sure that trading the team’s most valuable player would benefit short-term or long-term progress for the club. At the absolute worst, this becomes a lost season and the Bobcats go into next year with Nazr coming off the books and Boris’ expiring $9 million contract as a trade chip, too. The Cats could acquire a first rate big man, and pick up young talent in a deal. Hopefully, some of the younger guys can continue to improve and become starters or trade assets. In perspective, it looks like this season could be a big step for the team’s future growth. Still, we all want to see the Bobcats win some games on the court more than we want to cheer them for their payroll maneuvers. So, the best kind of “panic trade” just might be the type that lands another promising talent like Tyrus that can contribute now and only improve down the line. This just in: Jameer Nelson out of tonight’s game, Chris Duhon to start. Also, Stephen Jackson was just fined $50,000 by the league for verbally abusing a referee after the game yesterday. I hope it was worth it. It is drastic but tell me who on our team is going to net us a Center that is any better than what we have on the floor now? Where are we deepest the SF position. Jax is really a SF but playing SG on our team. We have UPS to back up the SF spot and is apparently the best young talent we have on the team. If not Crash then Tyrus they are basically the same type of player and nobody is going to touch the Tyrus contract at the moment. All people calling for him to start don’t realize him and Crash on the court at the same time is counter-productive. Maybe Kwame can help, but how much? We can definitely right the ship and perhaps make the playoffs… but for what? To at most win two games? Even with Nazr coming off the books already sitting at $58M for next year. That’s not going to leave us much money to bring in anybody because I doubt the cap is going up drastically if at all. What if it’s cut again. Make moves now or sell for pennies on the dollar at the trade deadline if we do not improve.